Shipping Vespa from S.A. to S.A.
Kenitra, Rabat & Fes και ο τουρισμός συνεχίζεται! It was the first time that Stergios and I would travel apart. 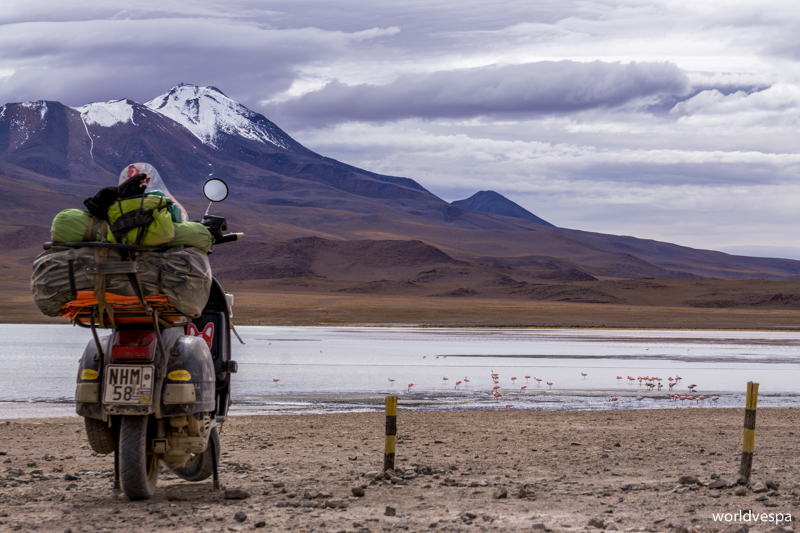 He would keep the vespa and only the necessary to survive in the harsh environment of the region with the famous volcanic lakes in the South of Bolivia – everyone had told us about the extreme difficulties we would have to face (no water, no fuel, no food, no people, almost nonexistent roads*) – and I, alone with no vespa nor Stergios but with 6 complete strangers in a 4×4 which would take us to Uyuni after 3 days. The 3 days that followed were an amazing experience for both of us! 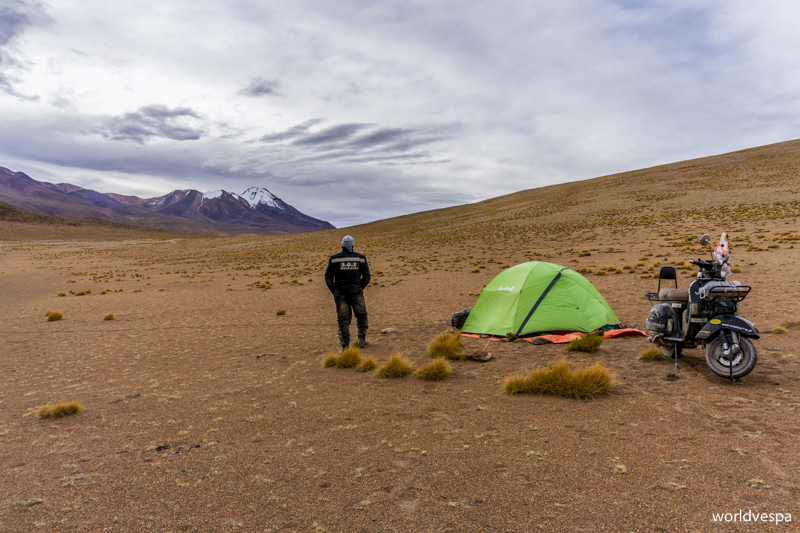 It wasn’t for the harsh conditions (which were harsh but not in an extreme way), but for the breathtaking scenery that we’ll never forget this trip! It was from another planet! 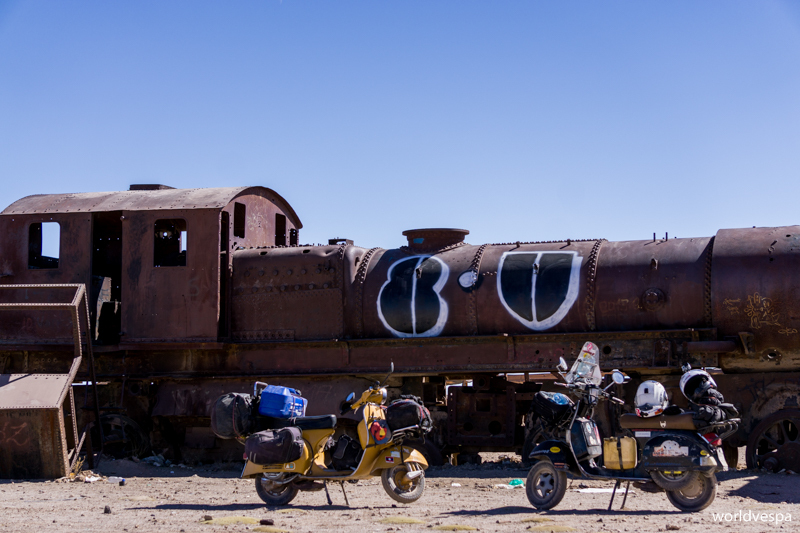 Back to the beginning: we were in San Pedro de Atacama. Still dark outside and Ι, utterly stressed, was getting on the minivan which would take our newly formed group to the borders with Bolivia (I was stressed and worried about Stergios because I had believed all these stories about the difficulty of the route…). After less than 1 hour, we had reached the border. Passport control, breakfast and off we go! 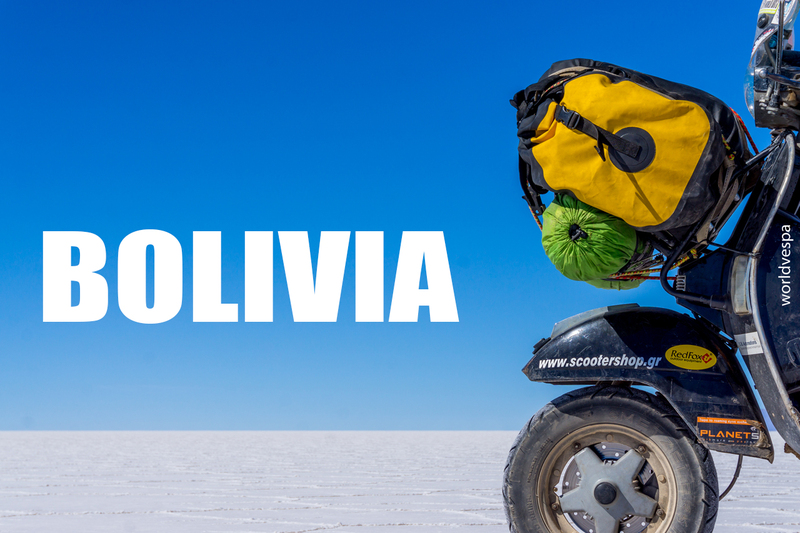 The Bolivian driver of the 4×4 (a 4500cc Lexus, with leather seats etc…same as the vespa!) didn’t make us wait for long. After some minutes’ waiting, he came and soon the “adventure” began. In the 4×4, there were 2 girls from the USA, 2 guys from the UK and 1 Canadian. From the first moment we met, I realized that I was probably the “odd one out”. It wasn’t the fact that they were born a whole decade after me, but that we were very different even in small things, such as the quantity of the alcohol they’d choose to consume, regardless of how much annoying it would make them to other people. 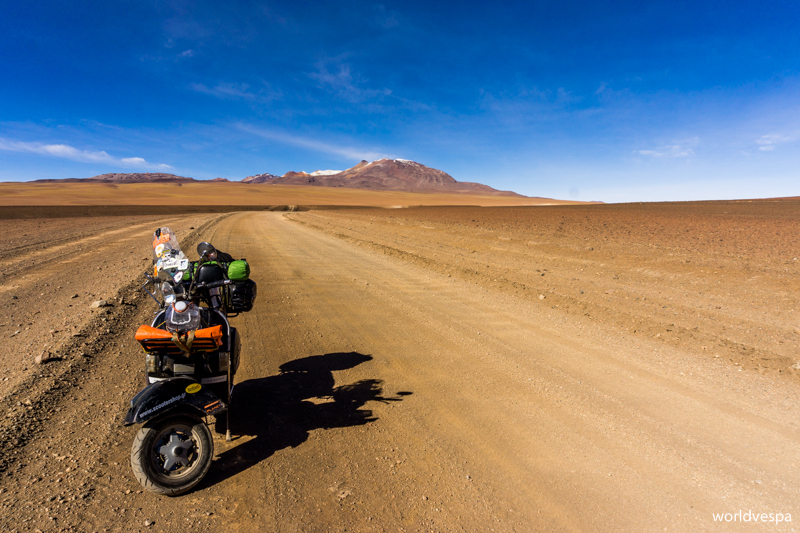 The adventure begins (entering Bolivia)! / Τώρα αρχίζουν τα ωραία (μπαίνοντας Βολιβία)! Soon, we were in the “Eduardo Avaroa National Park”, but before we even enter the area, we had our first clues about what would follow! We were already at 4000m above sea level and we’d climb up to more than 5000! 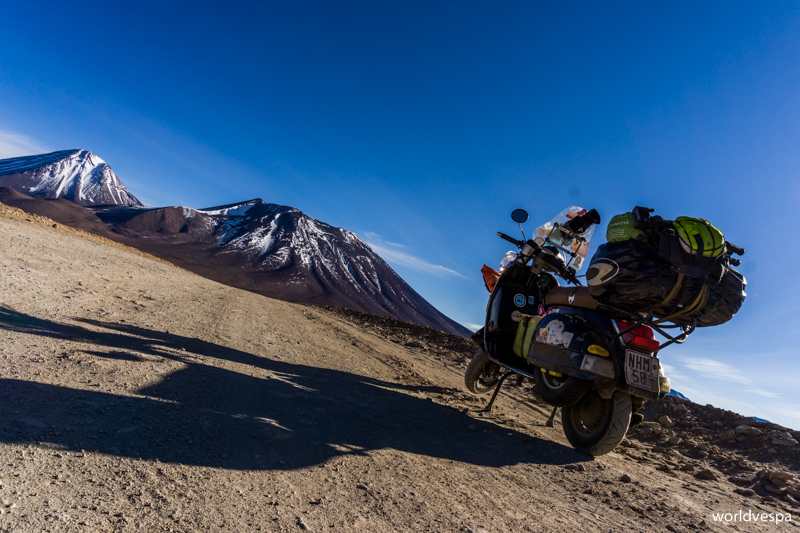 The volcanic landscape was one of the most breathtaking we had ever seen! 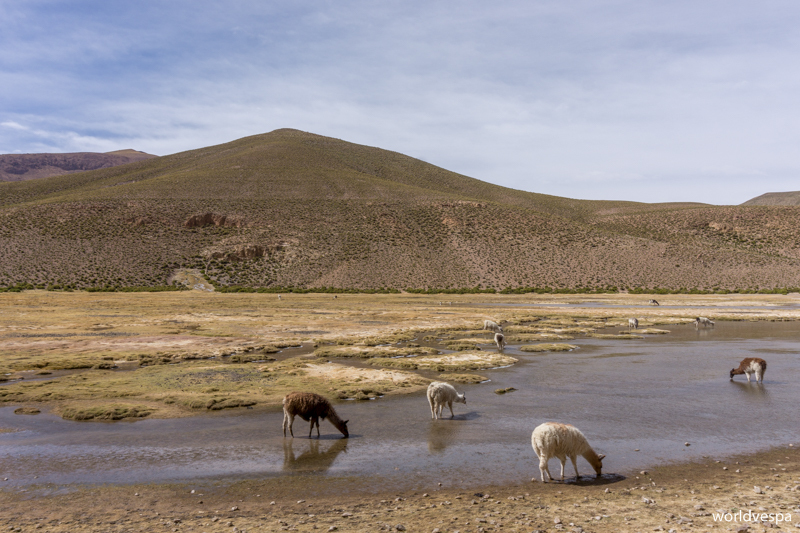 The flora and fauna was fully adjusted to the harsh environment and consisted in some yellowish small bushes which were the food of the vicuňas – the wild cousins of the llamas. Only some kinds of birds and other small animals could survive there (foxes, flamingos etc). The air was really thin and every effort resulted in gasping and panting! Fortunately, no-one got the altitude sickness which, as we’ve read, is not pleasant at all! A small break for a dive in the relieving warm water of the hot springs was what I was dreaming of – Instead, I only had my feet wet because I didn’t have a swimming-suit with me. While I was waiting for the rest of the group to finish, I took the opportunity and walked on the frozen shores of the nearby lake which were full of borax. The geysers, where we went next, were also interesting. The “exhaust” of the earth…amazing power and smelly gasses! Our day finished in the shelter next to the Lake Colorada. We had a simple though tasty dinner (soup and spaghetti) and an infusion made of coca leaves and some herbs of the area. Of course, we were not alone in the shelter. There were some other 6-people groups – English speaking in their majority – who were in search of wine (which unfortunately they found…). Soon, I hid in the dormitory under 5-6 woolen blankets and wrapped myself inside my sleeping-bag – if I’d seen a llama, I would also have taken it and use it as a blanket. I fell asleep with some questions: Where the hell was Stergios?! Did he make it to the Lake Colorada?! Did he see the “WORLDVESPA” sign I wrote on the sand at the shore?! Stergios was fine! Alive and kicking and after 3 days – while we were in Uyuni celebrating with some glasses of wine – he told me his side of the story which I’ll write here: He left from Sad Pedro de Atacama about 1 hour after I had left. With no problems at all, he took a 30-days visa and the license for the vespa and crossed the border (according to the law, we should have a 90-days visa – only 1 month later we understood why we had been given a 30-days one…although we knew we don’t have to pay anything, the officer at the immigration office in Uyuni asked 20BOB in order to give us the extension we needed!). With great relief, he learned there that the customs office was now next to the passport control office and not on some mountain 5000m above sea level. Some time ago, it was next to a mine in order to be easier for the company to do business and not easily reachable for the travelers who had their own vehicles. The only thing that Stergios hated was the “I-Know-Everything” officer who sarcastically laughing, told that “this thing can go nowhere in these mountains”…he meant the vespa! Speed limit: 60km/h…now that I know, I’ll slow down! / Ανώτατο όριο 60…Καλό! Λες κι εγώ μπορώ να πάω με περισσότερα! Admiring the jaw-dropping beauty of the scenery, he went on to the Lakes. The route was difficult but in no case impossible to cross. The only thing which was really annoying for the vespa and for its rider was that the road was corrugated due to the lack of rain and the hundreds of vehicles passing-by. The GPS proved useful because the road he had to take to Lake Colorada was more of “tracks on dirt” than of a dirt road. Trying to find his way without any help from the GPS, he somehow found himself at the exact place that he was happy he had avoided: at more than 5000m above sea level, next to the entrance of the mine where the customs office used to be! After he decided to be more careful, he soon reached the Lake Colorada and went to one of the shelters of the area. Having no idea about the exact location and number of all the shelters of Lake Colorada, he looked for me in 2-3 of them, but with no luck. He dined with the pleasant company of a small group of other visitors and went to sleep in a quiet dormitory, under many blankets. 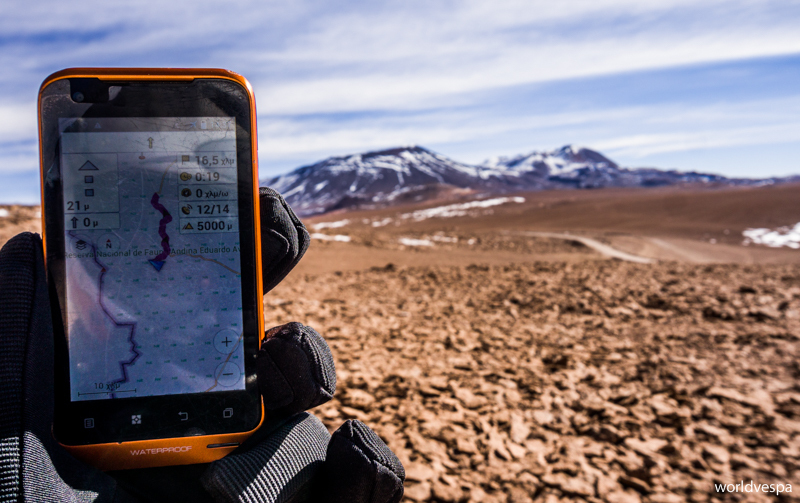 It’s difficult to find your way in most parts of the route. You have to follow the tracks of the 4x4s and have a GPS (for normal people) or a compass (for people like Liam). / Σε μεγάλο μέρος της διαδρομής δεν υπάρχει δρόμος. Απλά ακολουθείς τα ίχνη των 4Χ4 και προσπαθείς να μη χαθείς. Καλό είναι να έχεις κι ένα GPS αν είσαι κανονικός άνθρωπος, ή πυξίδα αν είσαι μερακλής (ή Liam). 5000 meters above sea level! / Έλα και πιάσαμε το πεντοχίλιαρο! The next morning – before sunrise – I woke up, got ready and impatiently waited to leave the shelter. While waiting, I took a walk around, saw some sleepy alpacas and admired the sunrise above the lake! The rest of the group were still sleeping and only after Emeterio, our guide, woke them up they started packing and yawning. After having our breakfast, we got on the 4×4 and continued our trip. I was happy and curious about what we were about to see, but the rest of the group were suffering from an awful hangover and the phrase that came to my mind but never left my mouth was: “I told you so!”. 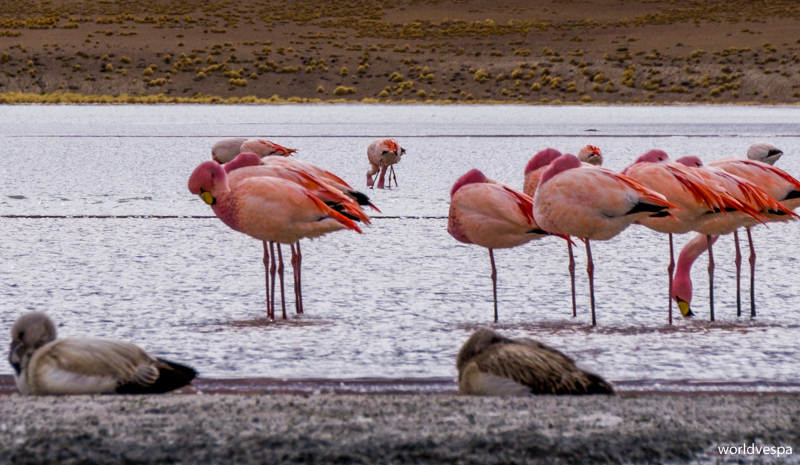 However, I kinda liked them in the end, so I won’t say anything else about them…The day passed with more lakes, more flamingos, more volcanoes, more vicuňas. Not even for a minute did I get bored, it was amazing! 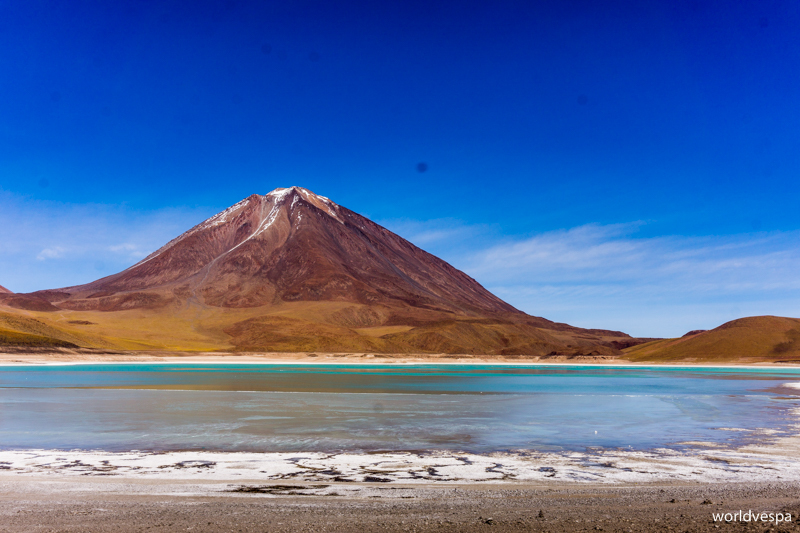 We admired the less famous Laguna Negra (Black Lake) and its dangerous, due to acids, waters. 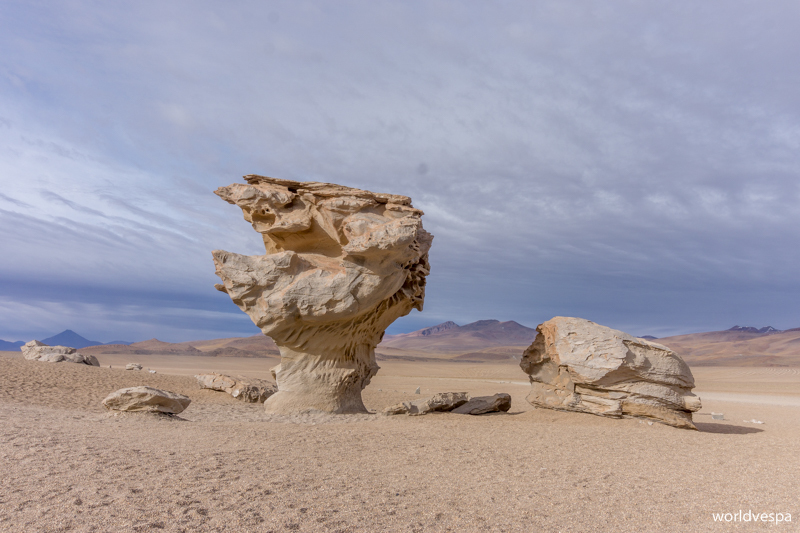 We took some pictures of the “Arbol de Piedra” (stone tree) and of other less popular rock formations but the most(!?) interesting part of that day was when we saw another celebrity of the region: a dusted long-bearded guy on a poor vespa! Yep, it was Stergios, who was covered in dust but continuing with no problems! I was screaming from the back seat of the 4×4, but he couldn’t listen. Only when Emeterio overtook him and I was hanging almost out of the car, did he realize that it wasn’t some tourists screaming and laughing, but it was me! At last, he stopped! He also woke up very early in the morning and got ready to hit the road again. Too bad he didn’t have some instant coffee with him, because after some minutes his cup of water had frozen and he could have enjoyed a cup of iced coffee – his favorite back in Greece! 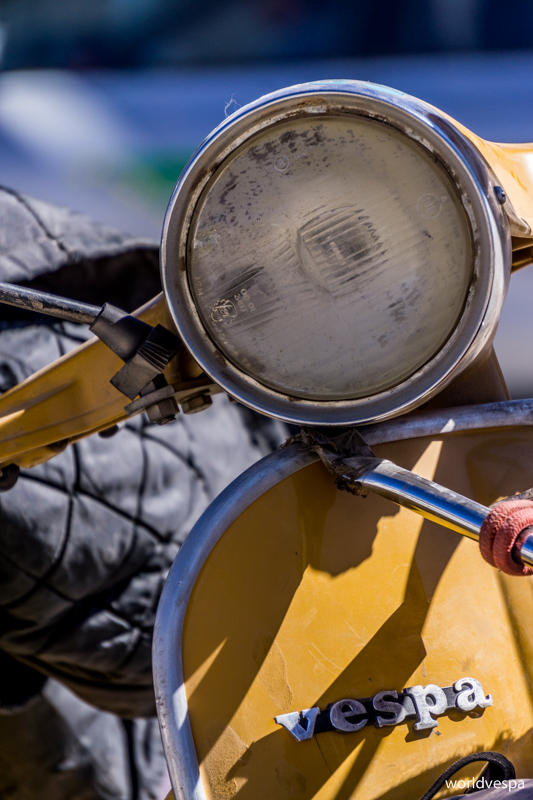 The corrugation of the road around Lake Colorada was deeper and more annoying and Stergios was sure that something would get loose and fall off the vespa! After we met on the road, he chose to go towards the Lakes Honda and Hendionda – the most difficult part, as we had been told. We had chosen another route which combined the 2 usual itineraries of most of the travel agencies. The 6 of us were a combination of 2 different agencies that had different plans, so our guide chose to improvise a bit. 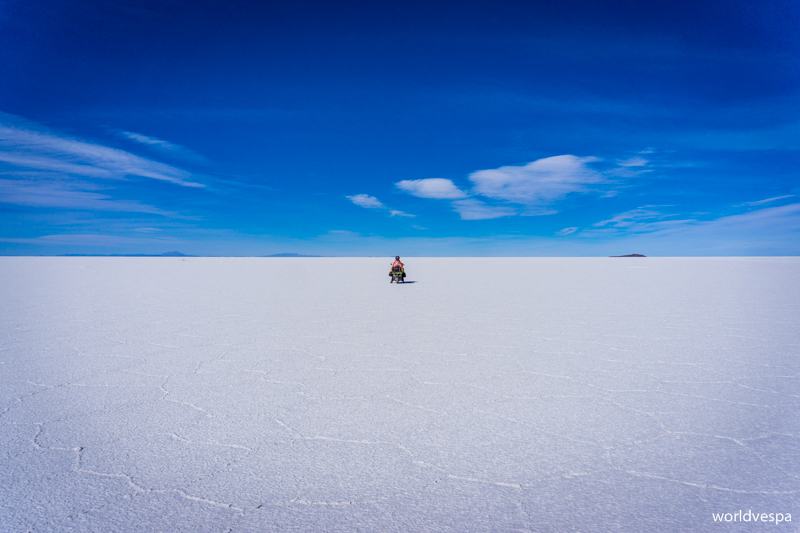 After some serious consideration, we concluded that there was no chance of meeting Stergios anywhere else than in Uyuni. The Lakes Honda and Hendionda offered Stergios – apart from magical views – some more private meetings with the local fauna: Some tens on flamingos danced in harmony on the surface of the lake only for him, some vicuñas were grazing almost next to his tent and a little fox got so close to him that he considered taking it with him as a pet! The night he spent there, was a unique experience! He decided to pitch the tent a bit further from the Lake Honda. The shelter that was close to the place, was a bit expensive, but that wasn’t the reason he spent the night in the tent. No shelter can be compared to a night in such a scenery! The wind was strong and freezing and he had to gather stones and put them above the tent-poles. 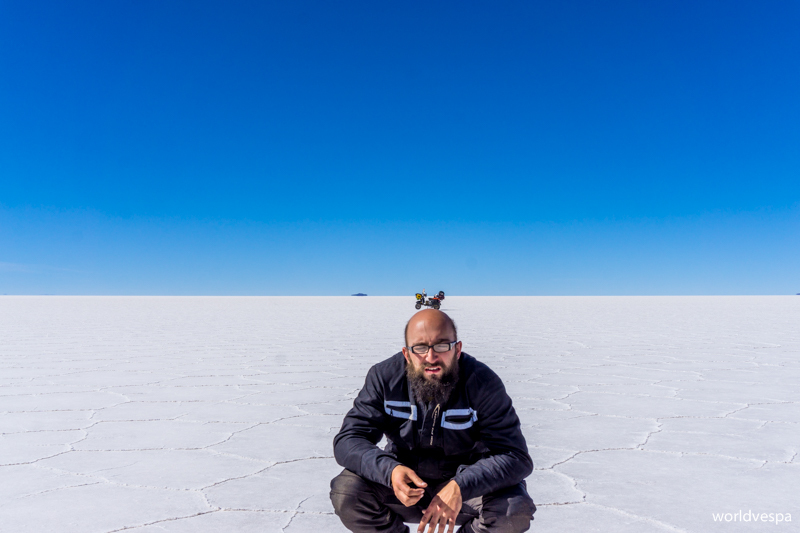 When we finally met in Uyuni and showed me his hands which had been bleeding due to the harsh cold, I realized that things up there, aren’t that easy! Moreover, he woke up from the freezing cold several times during the night, despite wearing all his clothes and being wrapped up in the sleeping-bag. 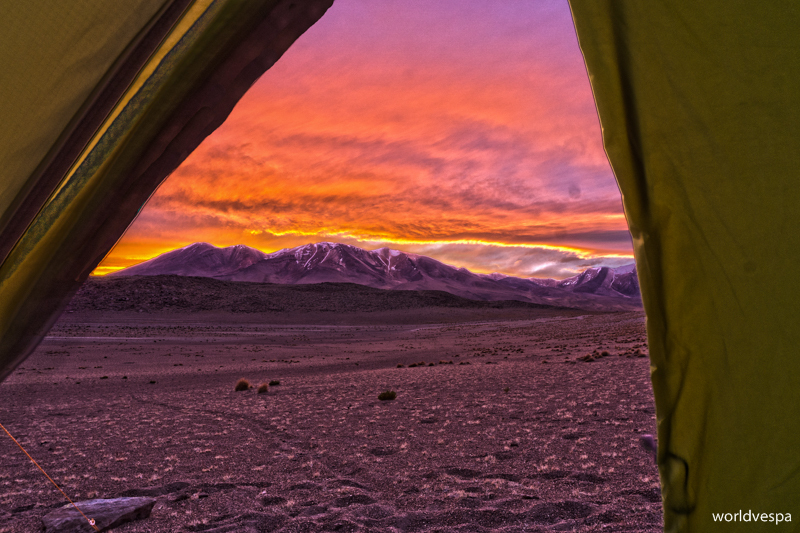 Wild-camping at 4,200m, freezing cold, but the view makes you forget about it! / Ελεύθερη κατασκήνωση στα 4.200μ, με κρύο να σου τρυπάει τα κόκαλα, αλλά θέα που σε κάνει να το ξεχνάς! Meanwhile, our little group were in warmer conditions. We had reached the small village of Villa Candelaria and we were already in the hostel where we would spend the night. The hostel was made of salt! Pure white salt from the nearby Salar de Uyuni! 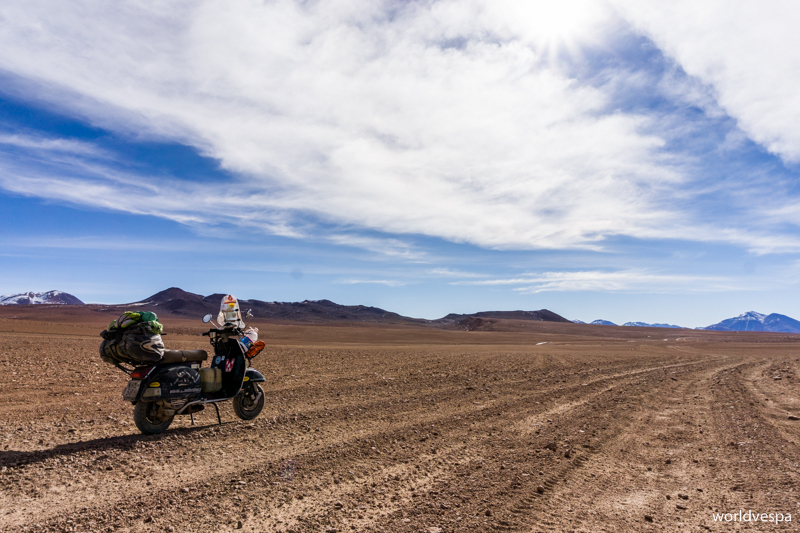 The famous salty desert of Bolivia which we were planning to visit the next day. Our salty hostel wasn’t the only one in the area, but for us it was unique. Even our beds were made of salt. And while we were thinking that we would freeze again, the landlady lit a fire in the fireplace and served hot soup. We had our dinner and quickly went to bed because we had to be ready to go before sunrise. 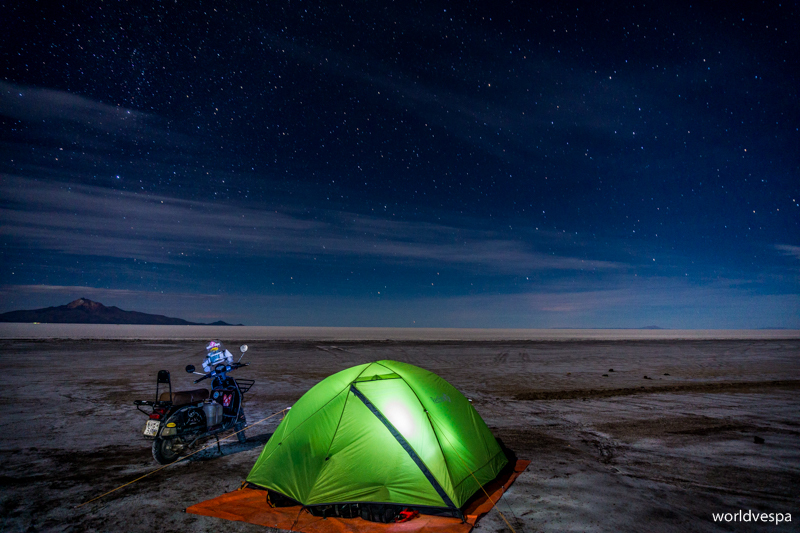 The idea was to admire the sunrise in the middle of the Salar de Uyuni. 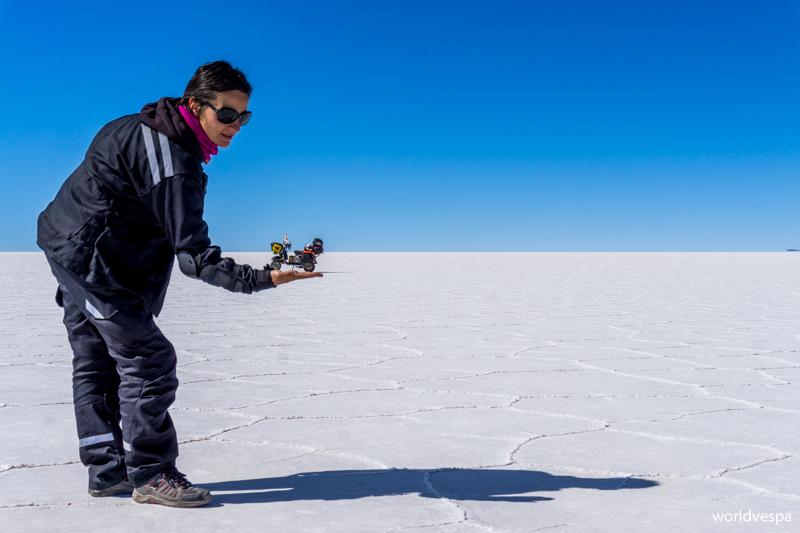 Being in the Salar de Uyuni is one trully unique experience. We had forgotten about our early waking and the only thing that mattered at that point was the magnificence of the scenery! The ultimate blue and the ultimate white were playing games with our senses and we had to keep our eyes wide open to realize that this was something real! 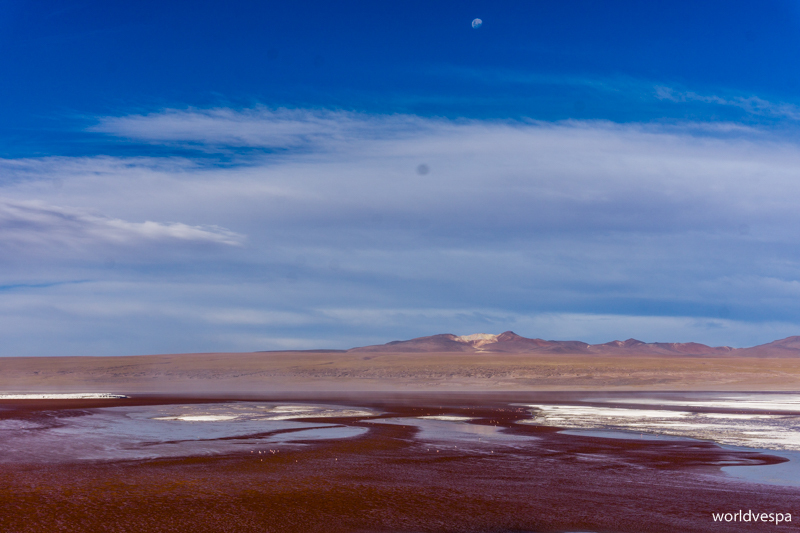 After our first 40-50 minutes in the Salar, we reached the Incahuasi Island. A place that every cactus lover has to visit. Cacti everywhere on the island and around it, the pure whiteness of the salt! 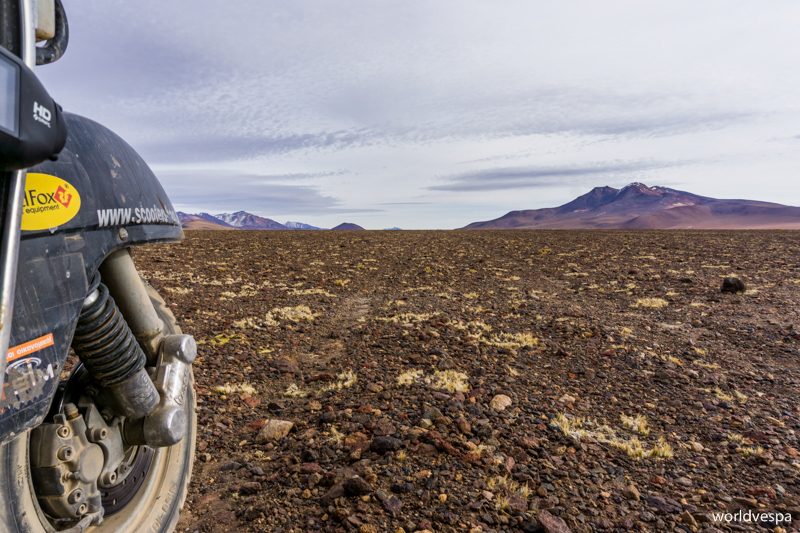 I kept myself from being utterly dazed by the Salar because I had promised Stergios that we would visit it together on our vespa. It would surely be even more interesting this way and not with a 4×4 full with strangers…Now, that I mentioned it, where was Stergios?! The small town wasn’t a beautiful one, but after so much time we spent there, we started liking it. 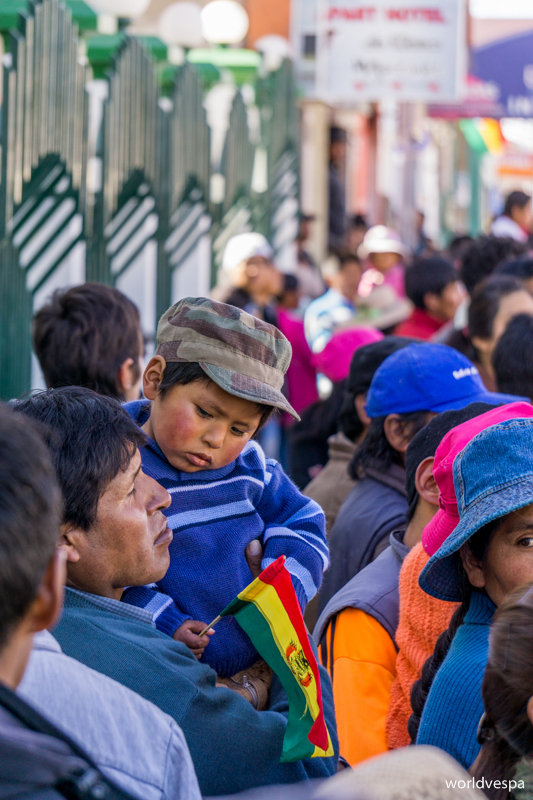 Additionally to this, it was the first Bolivian town we saw, so there were many things which attracted our attention: its central marketplace where one can find almost anything, from vegetables and meat, to packed goods, flowers, cooked lunch etc was the first place we visited. 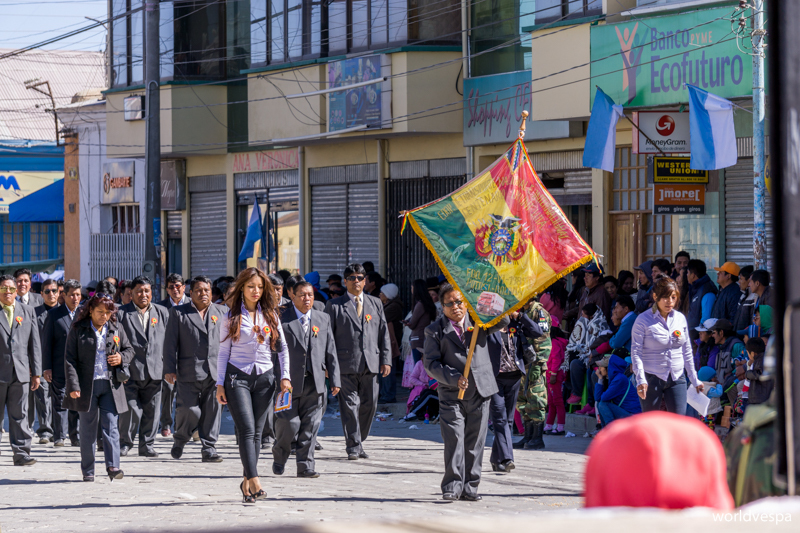 Also, without knowing it, we were in Uyuni during the month of the annual celebrations for the town’s anniversary! 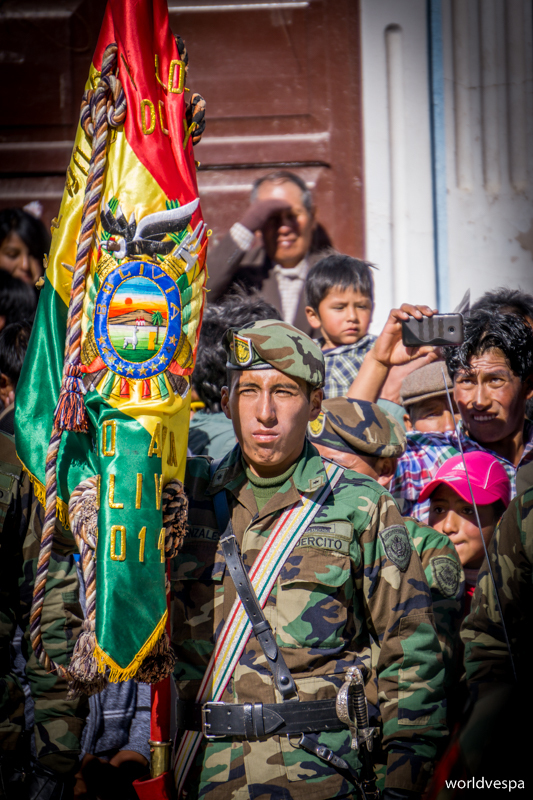 Everyday, we could listen to the army’s band practicing and on the 11th of July, we attended the parade – schools-colleges-sports teams-unions…everyone took part in the parade! What else?! – During Sunday evenings there were fairs organized in the square, where one could play in the lottery or practice in an open-air karaoke or eat a freshly cooked dinner or win a huge and weirdly ugly teddy-bear…However, our daily highlight was eating in the local “parrilladas” different kinds of barbequed meat (my favorite one was llama-ribs). 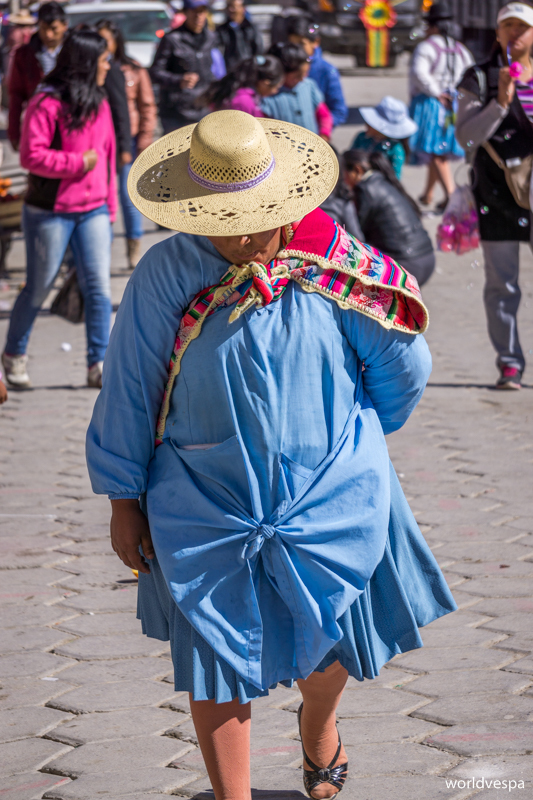 The people of Uyuni were friendly and nice and Bolivia was a cheap country – especially for us who had previously been in Chile (San Pedro de Atacama), where everything was expensive. One day, while I was still in bed suffering from something I can’t longer remember, Stergios went out to do some shopping. Instead of bringing home the grocery, he brought another traveler. 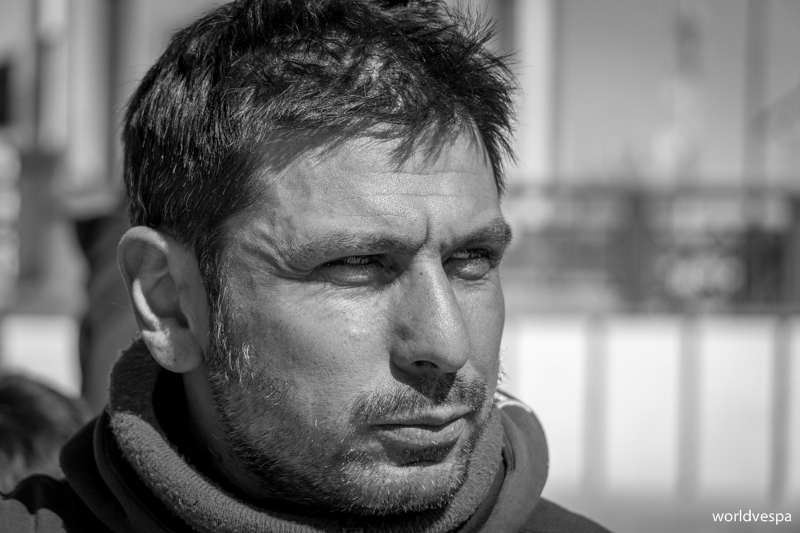 It was Luca (ilgirodelmondoa80allora.com), the Italian guy who was also traveling around the world on his vespa (a TS 125)! What a coincidence! The next 2 days passed with vespa-talks, vespa-walks and vespa-photos! It’s really nice to meet other travelers with whom you have so many thing in common. 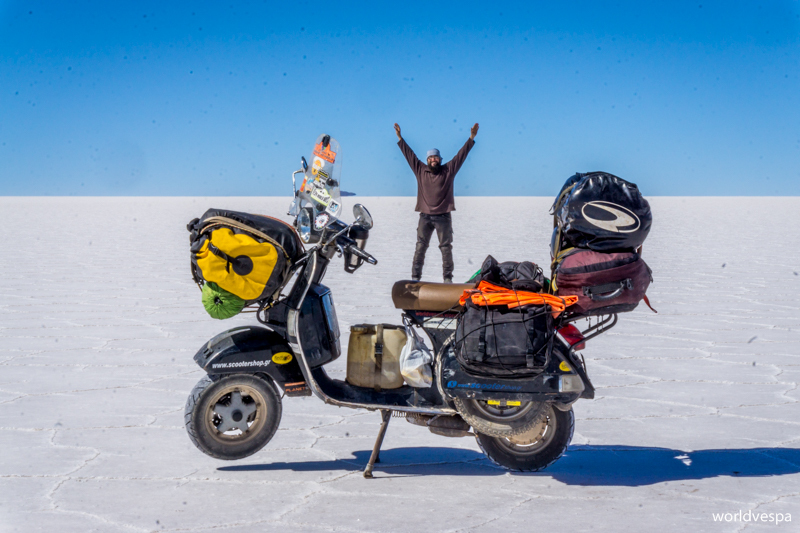 I don’t mean only the fact that he was also a vespa-guy, but also, that we could agree in many things about life, travel etc…Unfortunately, we had to stay in Uyuni and Luca had to continue north. He had a deadline and in some months he had to be back to Italy. We are sure that we’ll meet again sometime. 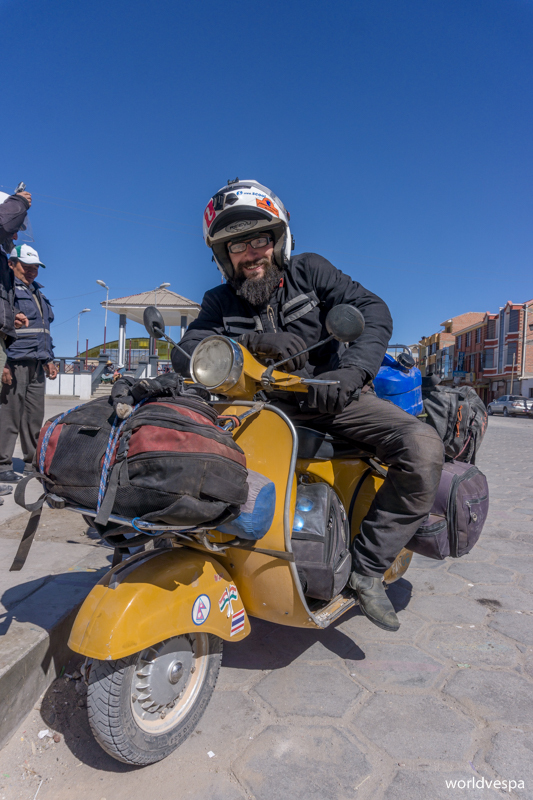 Luca: The Italian (traveling also on a Vespa) we met by coincidence in Uyuni! / Ο Λούκα: Ο Ιταλός (επίσης ταξιδεύει με βέσπα) που συναντήσαμε τυχαία στο Uyuni! 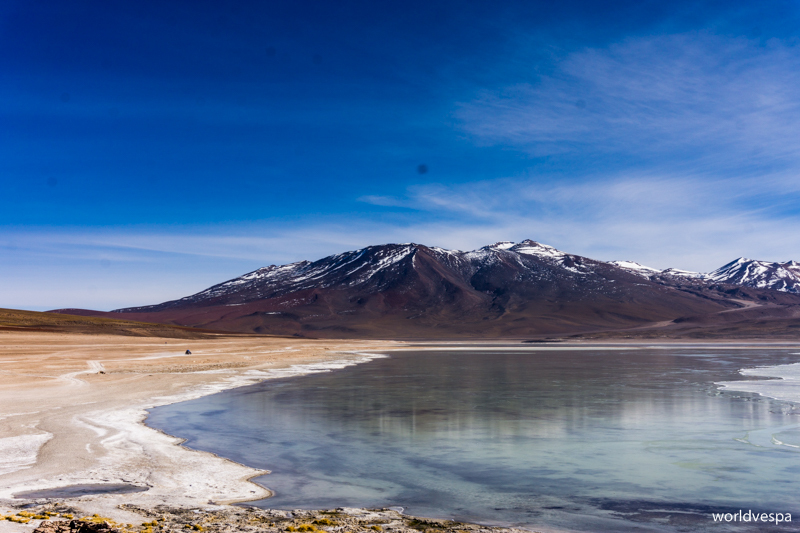 After 3 weeks, 2-3 food poisonings, a hurt back, an infection, a cold, countless llama-ribs, some liters of beer, a collection of photo-portraits of Bolivians…we left the town to visit the Salar at last! 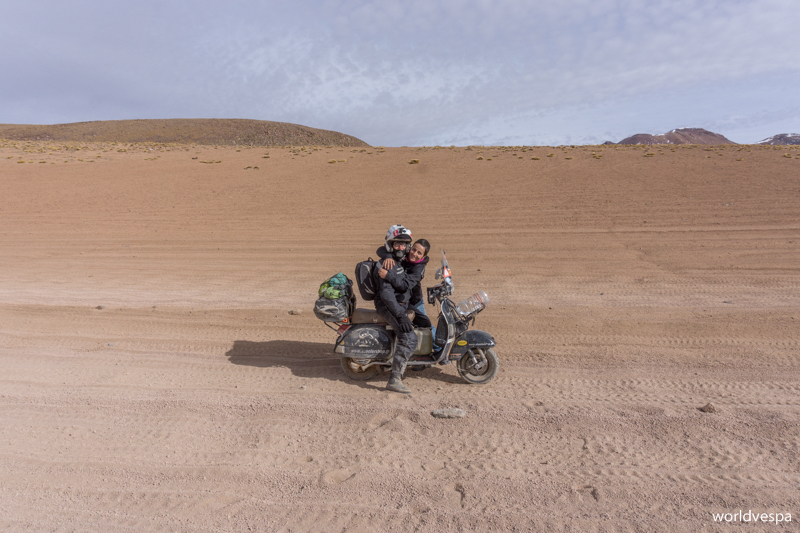 I had an idea of what we were about to see, because we had a quick pass through the Salar on the 4×4, but it is completely different being in a closed vehicle with a bunch of strangers and being on the little vespa only with your co-traveler! 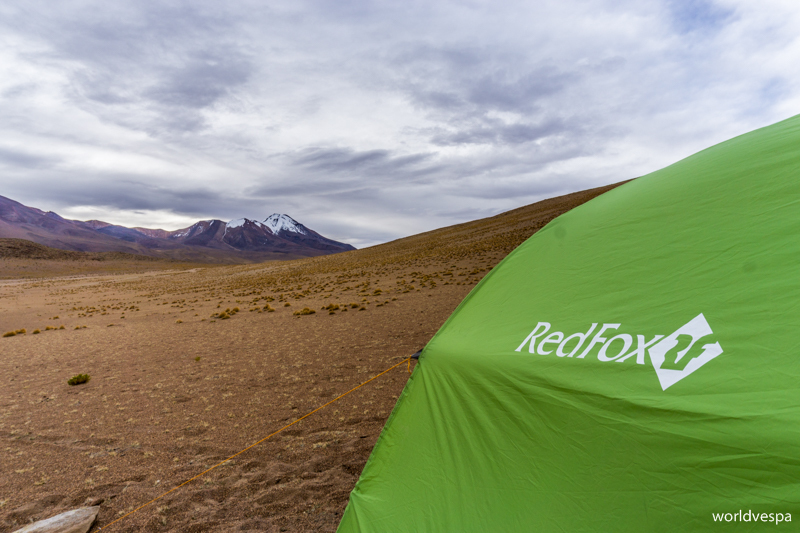 The plan was to spend the night in our tent somewhere in the Salar and I was a bit worried about the cold. We decided to stay next to the “Isla del Pescado” which is some kilometers away from the more popular, “Isla Incahuasi” where all the groups with the 4x4s go. 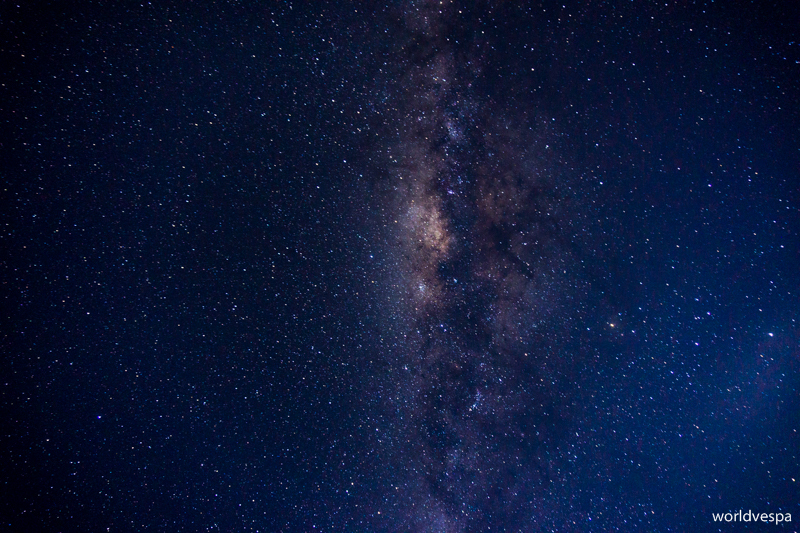 From the first kilometers on the endless white flat area, we were left speechless, but the night that followed was something to remember for a lifetime! 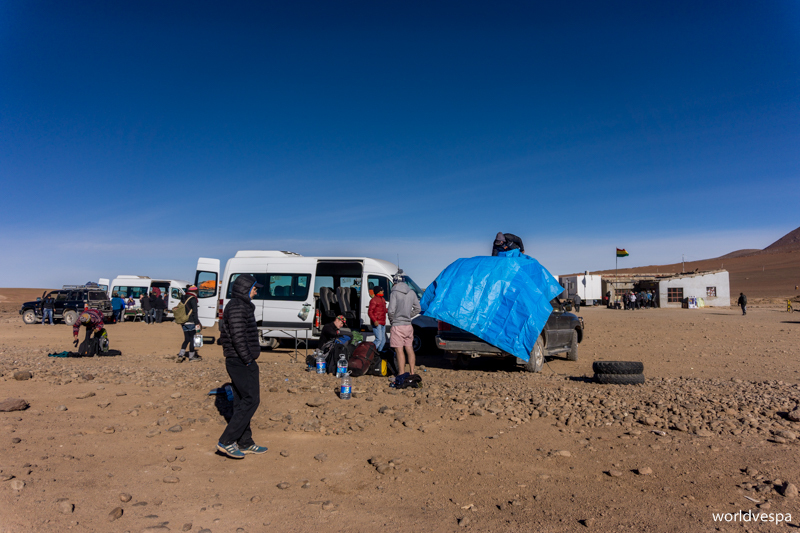 Every small detail was in favor of us, making the experience unforgettable: the cold wasn’t that harsh, the wind wasn’t strong at all, the moon retreated to allow the millions of stars to make an appearance and additionally to all these, the last travelers who had stayed there, had left some wood and stones to make a fire! What else to ask for?! The pictures we took that night are only a small example of the breathtaking beauty of the place. 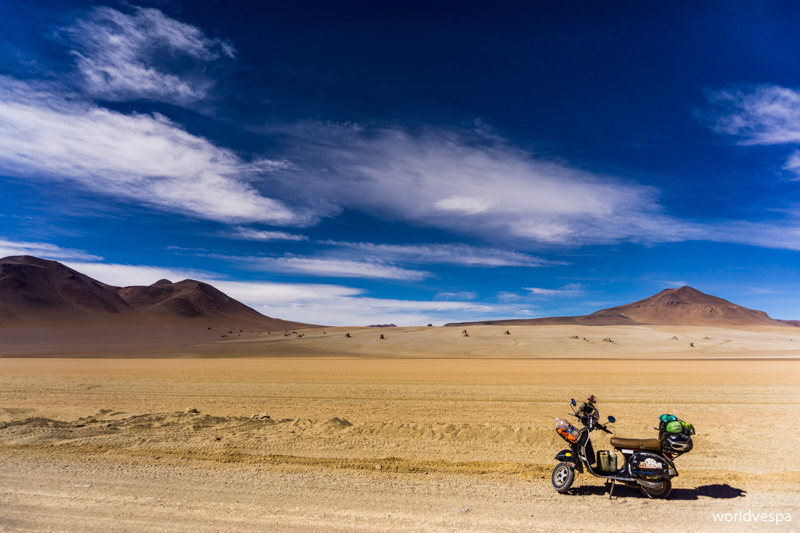 The next morning, we couldn’t resist temptation: we packed our things and went somewhere in the middle of the Salar to play some photographic perspective games with us and the vespa. It may be something not that original, but it’s really fun! Everything is a matter of perspective! / Όλα είναι θέμα οπτικής γωνίας! 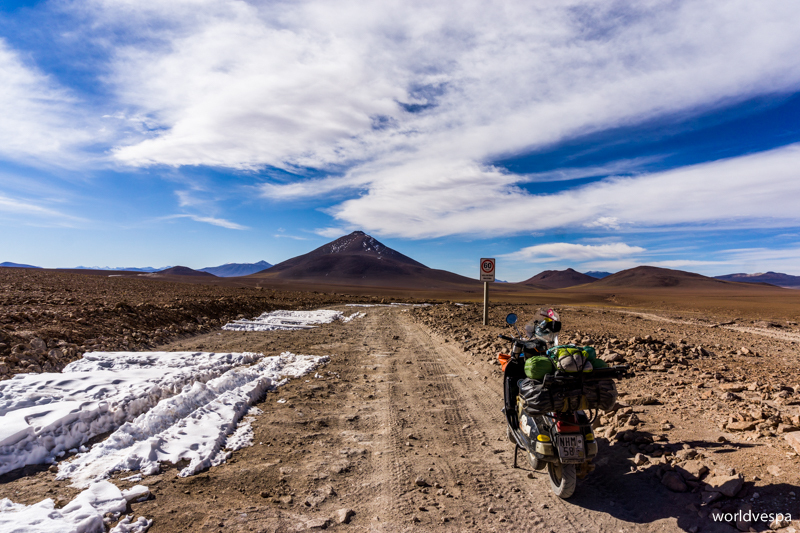 Although we liked the Salar so much, we decided not to spend more time there and we left for Potosi. During the last month, the general strike in Potosi was in the news and in every newspaper cover. Demonstrations, roadblocks, police and violence…We were sure that we would be able to cross the roadblocks and continue. 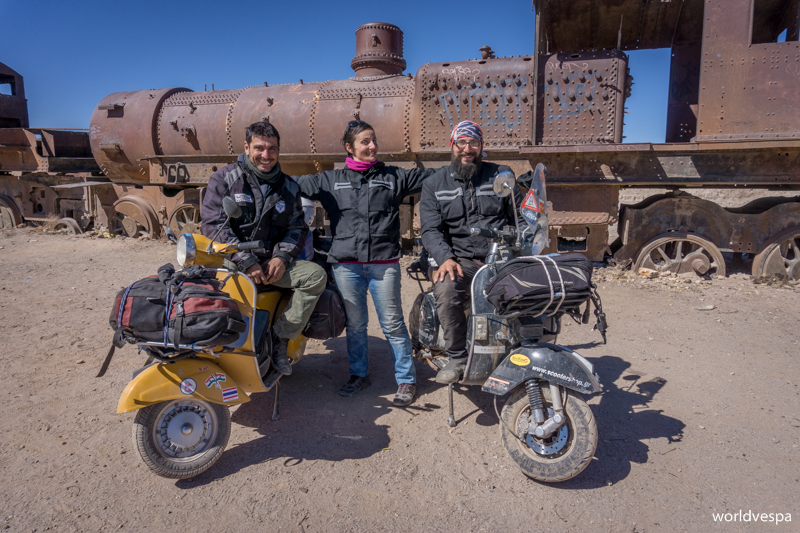 Who could say ‘no’ to a couple of dusted travelers on a poor vespa?! * Most of the stories we had heard, proved to be ridiculously exaggerated and some others close to the reality we faced. Here is a post, where we are presenting the “myths and realities” of the specific route. Πρώτη φορά που θα ταξιδεύαμε ξεχωριστά με τον Στέργιο. Αυτός με το βεσπάκι, κουβαλώντας μόνο ό,τι θα του χρειαζόταν για να επιβιώσει στις τρομακτικές συνθήκες που θ’ αντιμετώπιζε στην περιοχή με τις ηφαιστειακές λίμνες στο Νότο της Βολιβίας – για μια διαδρομή εξαιρετικής δυσκολίας μας είχαν πει οι περισσότεροι, προσπαθώντας να μας αποτρέψουν να περάσουμε από ‘κει (χωρίς νερό, τροφή, βενζίνη και με ανύπαρκτους δρόμους*) – κι εγώ μόνη, χωρίς Στέργιο και βεσπάκι…όχι ακριβώς μόνη δηλαδή, αλλά με την παρέα 6 αγνώστων σ’ ένα 4×4 που θα μας οδηγούσε με ασφάλεια μετά από 3 μέρες στο Ουγιούνι. Οι 3 αυτές μέρες που ακολούθησαν, αποτέλεσαν μια απίστευτη εμπειρία και για τους δυο μας! Δεν ήταν οι συνθήκες που τελικά αποδείχτηκαν όχι και τόσο τρομακτικές (δεν είχαμε και πολλές αμφιβολίες για τις διάφορες υπερβολές που ακούγαμε), αλλά τα ασύλληπτης ομορφιάς τοπία που αντικρίσαμε! Βρισκόμασταν σε άλλον πλανήτη! Πίσω στην εκκίνηση λοιπόν: είμαστε στο Σαν Πέδρο Δε Ατακάμα, ακόμη σκοτάδι μιας κι ο ήλιος δεν έχει κάνει την πρωινή του εμφάνιση κι εγώ γεμάτη άγχος (για την επιβίωση του Στέργιου – αν ξαναπιστέψω τις υπερβολές των διάφορων “ηρωικών” ταξιδιωτών, σας παρακαλώ, συνετίστε με!) επιβιβάζομαι στο βανάκι που θα οδηγήσει εμένα και το μικρό μου γκρουπάκι στα σύνορα με τη Βολιβία. Μετά από λίγη ώρα ήμαστε στα σύνορα. Έλεγχος διαβατηρίων, πρωινό γεύμα κι αναμονή για τον οδηγό μας και το 4×4 του. Μέσα σε λίγα λεπτά, ο Βολιβιανός οδηγός μας ήρθε κι επιβιβαστήκαμε στο 4x4, που ήταν ένα πολυτελές Lexus 4500 κυβικών, με δερμάτινα καθίσματα κι όλες τις ανέσεις. Κάτι σαν το βεσπάκι μας δηλαδή! Το γκρουπ μας αποτελούταν από 2 Αμερικανίδες, 1 Καναδό και 2 Άγγλους κι απ’ την πρώτη στιγμή που συστηθήκαμε, συνειδητοποίησα πως είμαι “the odd one out”, όπως λένε και στο χωριό μου! Δε φαινόταν να έχουμε πολλά κοινά κι αυτό όχι εξ’ αιτίας της ηλικίας τους (είχα γεννηθεί ίσως πάνω από μια 10ετία πριν απ’ αυτούς), αλλά λόγω της χαοτικής μας διαφοράς που φάνηκε σύντομα σε μικρά καθημερινά πραγματάκια. Για παράδειγμα το πόσο πολύ αλκοόλ μπορεί να πιει κάποιος ώστε να χαλάσει τη διάθεση μερικών αγνώστων γύρω του που δε φταίνε σε τίποτα! Μετά από λίγα χιλιόμετρα μπαίναμε στο Εθνικό Πάρκο Εδουάρδο Αβαρόα, αλλά ήδη είχαμε τα πρώτα στοιχεία για το πόσο απόκοσμα θεάματα θα βλέπαμε σύντομα! Ήμαστε λίγο παραπάνω από τα 4000 μέτρα από την επιφάνεια της θάλασσας και τις επόμενες μέρες θα σκαρφαλώναμε πάνω από τα 5000! Το τοπίο ηφαιστειακό, άνυδρο, πετρώδες! Η χλωρίδα και η πανίδα της περιοχής προσαρμοσμένη στις δύσκολες συνθήκες: vicuňas – τα χαριτωμένα άγρια ξαδερφάκια των llamas, αλεπουδάκια με ολόπυκνο τρίχωμα και φλαμίνγκο, πολλά ροζ φλαμίνγκο! Η βλάστηση περιοριζόταν σε κάτι υποκίτρινα χορταράκια, τροφή για τα vicuňas και μερικούς θάμνους που οι ντόπιοι ξεραίνουν και χρησιμοποιούν ως προσάναμμα. Ο αέρας φτωχός σε οξυγόνο, έκανε την παραμικρή κίνηση κουραστική και μετά από λίγα βήματα, ασθμαίναμε σα να βρισκόμαστε για πρώτη φορά σε τμήμα αεροβικής γυμναστικής! Ευτυχώς, είχαμε κάπως αρχίσει να προσαρμοζόμαστε στην έλλειψη οξυγόνου και σταθήκαμε τυχεροί με την ασθένεια του υψομέτρου που, όπως μας έχουν περιγράψει, δεν είναι καθόλου ευχάριστη. Ένα διάλειμμα για βουτιά στα νερά των θερμών ηφαιστειακών πηγών ήταν ό,τι πρέπει – αν κι εγώ κατάφερα και ζέστανα μόνο τις παγωμένες μου πατούσες…η έλλειψη του κατάλληλου ενδύματος για βουτιές αποτέλεσε τροχοπέδη! Βέβαια, είχα την ευκαιρία να τραβήξω μερικές ακόμη φωτογραφίες και να πατήσω στις παγωμένες και γεμάτες βόρακα όχθες της παρακείμενης λίμνης. Οι θερμοπίδακες όπου πήγαμε μετά, ήταν θορυβώδεις, εντυπωσιακοί κι ολίγον τί βρωμεροί, αφού τα αέρια της γης είναι γεμάτα θειάφι κι άλλες οσμηρές ενώσεις! Μετά απ’ όλες αυτές τις καινούριες εμπειρίες, σειρά είχε το καταφύγιο στην όχθη της Laguna Colorada: δείπνο και ξεκούραση γιατί η επόμενη μέρα θα ξεκινούσε πολύ νωρίς. Το φαγητό στο καταφύγιο ήταν απλό, αλλά νοστιμότατο κι αποτελούταν από χορτόσουπα και μακαρονάδα καθώς επίσης κι από ένα ζεστό ρόφημα από φύλλα κόκας κι ακόμη ένα βότανο που φύεται στα βουνά της περιοχής. Στο καταφύγιο λοιπόν, δεν ήμαστε μόνοι. Εκτός από το 6μελές γκρουπάκι μας είχαν καταλύσει κάμποσα ακόμη 6μελή γκρουπάκια – στην πλειοψηφία τους αγγλόφωνα – που σύντομα ανακάλυψαν πως μπορούν να έχουν στη διάθεση τους αρκετό κρασί! Σε λίγη ώρα, έγινε σαφές πως δεν είναι πολύ έξυπνη ιδέα η κατανάλωση υπερβολικών ποσοτήτων αλκοόλ σε υψόμετρο πάνω από 4000 μέτρα. Όταν πλέον η κατάσταση έγινε ενοχλητική, αποσύρθηκα στον καταπαγωμένο κοιτώνα και κουκουλώθηκα κάτω από 5-6 ολόμαλλες κουβέρτες, το σλίπινγκ-μπαγκ μου κι ένα λάμα που περνούσε τυχαία και το πήρα αγκαλιά! Έβαλα και την αποκρυσταλλωμένη μύτη μου κάτω από τα σκεπάσματα και κοιμήθηκα μέχρι το επόμενο ξημέρωμα. Με τις εξής απορίες με πήρε ο ύπνος: Που στο καλό ήταν ο Στέργιος;! Έφτασε στη Laguna Colorada;! Είδε το “WORLDVESPA” που έγραψα στην άμμο στην όχθη της λίμνης;! Με το σαγόνι ξεχασμένο ανοιχτό λόγω της απίστευτης ομορφιάς του τοπίου συνέχισε προς τις λίμνες. Ο δρόμος δύσκολος αλλά σε καμία περίπτωση αδιάβατος. Βέβαια, η διάβρωση από τον αέρα, την ανομβρία και τα οχήματα που περνούν, έκαναν το βεσπάκι να χοροπηδάει και να κουδουνίζει! Το GPS αποδείχτηκε χρήσιμο, αφού ο δρόμος προς τη Laguna Colorada ήταν “ίχνη από ρόδες στο χώμα”, ενώ ο δρόμος για το προαναφερθέν ορυχείο ήταν απλώς χωματόδρομος. Κάπως έτσι λοιπόν, βρέθηκε στο ορυχείο (ναι, σ’ αυτό που ήταν χαρούμενος που είχε αποφύγει, αφού το τελωνείο δεν ήταν πια εκεί! ), λίγο πάνω από τα 5000 μέτρα κι αποφάσισε να είναι πιο προσεκτικός με τα “ίχνη από ρόδες στο χώμα”. Χοροπηδώντας και κουδουνίζοντας, κατάφερε την πρώτη μέρα να καλύψει την απόσταση των 180χμ και να φτάσει ως τη Laguna Colorada! Τί ωραία! Σύντομα θα μ’ έβρισκε στο καταφύγιο και θα περνούσαμε το βράδυ παρέα…αμ δε! Το καταφύγιο δεν ήταν ένα. Στην περιοχή υπήρχαν κάμποσα ακόμη και φυσικά κανείς από τους δυο μας δεν το ήξερε. Πήγε λοιπόν σε κάποια απ’ αυτά κι άρχισε να ρωτάει για μια Ελληνίδα ονόματι Αλεξάνδρα. Αφού συνειδητοποίησε πως μάλλον ήταν μάταιο να με βρει, δείπνησε με μια όχι μεθυσμένη παρέα, κουκουλώθηκε κι αυτός κάτω από 5-6 κουβέρτες και κοιμήθηκε. Ξημέρωμα της δεύτερης μέρας και πριν ο ήλιος κάνει την εμφάνισή του στον κόσμο μας, είχα ήδη σηκωθεί απ’ το κρεββάτι, είχα μαζέψει τα πράγματά μου και περίμενα ανυπόμονα να ξεκινήσει η μέρα. Τα λάμα ακόμη χουζούρευαν λίγο μακρύτερα απ’ το καταφύγιο και η παρέα μου δυστυχώς ροχάλιζε ακόμη χωρίς καμία πρόθεση να ξυπνήσει. Ο Εμετέριο, ο οδηγός μας, διακριτικά τους ξύπνησε κι αφού πήραμε το πρωινό μας, ξεκινήσαμε για το δεύτερο κομμάτι της διαδρομής μας στο Εθνικό Πάρκο Εδουάρδο Αβαρόα. Η παρέα μου υπέφερε από ένα βασανιστικό hangover που είχε δημιουργηθεί από τον συνδυασμό αλκοόλ και υψόμετρου κι από μέσα μου η φρασούλα “σας τα ‘λεγα εγώ” δεν έλεγε να σταματήσει να επαναλαμβάνεται. Δε θα ξαναπώ όμως τίποτα αρνητικό για τα παιδιά γιατί, αν εξαιρέσουμε το γεγονός πως διαφέραμε πολύ σε όλα, ήταν ευγενικά και μάλλον συμπαθητικά. Κι άλλες λίμνες, κι άλλα ηφαίστεια κι άλλα vicuňas, κι άλλα φλαμίνγκο…ούτε για μια στιγμή δε βαρέθηκα! Η Laguna Negra (μαύρη), απλωνόταν μπροστά μας κι από τις περιγραφές του Εμετέριο, του οδηγού μας, μας έγινε σαφές πως τα νερά της είναι πολύ επικίνδυνα! Μια βουτιά εκεί μέσα μπορεί να προκαλέσει σοβαρές δερματικές αλλοιώσεις! Το “πέτρινο δέντρο” κι άλλοι βραχώδεις σχηματισμοί που έχουν σμιλευτεί από τον ασταμάτητο αέρα ήταν εξ’ ίσου ενδιαφέροντες, αλλά το εντυπωσιακότερο όλων ήταν η συνάντηση μ’ έναν σκονισμένο μουσάτο τύπο καβάλα σε μια βέσπα! Ναι, ήταν ο Στέργιος που, κάτασπρος απ’ τη σκόνη, συνέχιζε απτόητος την πορεία του! Του φώναξα απ’ το ανοιχτό παράθυρο του 4x4 κι αυτός δε μου έδωσε σημασία! Μετά από ακόμη λίγα ουρλιαχτά, χαιρέτισε χωρίς να κοιτάξει προς το μέρος μου και μόνο όταν ο Εμετέριο τον προσπέρασε κι εγώ κρεμόμουν έξω απ’ το παράθυρο για να με δει, με κατάλαβε και σταμάτησε. Ξύπνησε κι αυτός από τα μαύρα χαράματα κι ετοιμάστηκε να φύγει απ’ το καταφύγιο με το ποτήρι του γεμάτο νερό για το δρόμο…κρίμα που δεν είχε νεσκαφέ μαζί του, γιατί με τα παγάκια που σχεδόν αμέσως δημιουργήθηκαν στο ποτήρι, θα μπορούσε να φτιάξει το φραπεδάκι που τόσο λαχταρά σ’ όλο το ταξίδι και σχεδόν ποτέ δε μπορεί ν’ απολαύσει! Η διάβρωση του δρόμου γύρω από τη Laguna Colorada ήταν αρκετά ενοχλητική και η βέσπα χτυπιόταν και κουδούνιζε τόσο, που ήταν σίγουρος πως όλο και κάτι θα ξεβιδωθεί! Αφού συναντηθήκαμε, ο Στέργιος πήρε το δρόμο προς τις λίμνες Honda κι Hendionda, διάλεξε δηλαδή τη διαδρομή που μας είχαν πει πως είναι δυσκολότερη, ενώ ο οδηγός του γκρουπ με το οποίο ταξίδευα, διάλεξε μια άλλη διαδρομή που συνδύαζε μερικά από τ‘ αξιοθέατα και των δυο βασικών διαδρομών που ακολουθούνται συνήθως. Αυτό δεν έγινε επειδή ο οδηγός μας ήταν μερακλής, αλλά επειδή οι 6 της ομάδας μας προερχόμασταν από διαφορετικά ταξιδιωτικά γραφεία που καθένα απ’ αυτά πρόσφερε άλλο εκδρομικό “πακέτο”. Για να μην πολυλογώ με τα των ταξιδιωτικών γραφείων, καταλήξαμε απλά να δεχτούμε πως δεν υπάρχει περίπτωση να καταφέρουμε να ξανασυναντηθούμε με τον Στέργιο, παρά μόνο στο Ουγιούνι. Οι λίμνες Honda κι Hendionda προσέφεραν στον Στέργιο – εκτός από καταπληκτικά τοπία – μερικές πιο πριβέ συναντήσεις με την τοπική πανίδα! Μερικές δεκάδες από φλαμίνγκο έκαναν τις χορευτικές τους φιγούρες σε απόλυτη αρμονία μόνο γι’ αυτόν. Κάμποσα vicuñas βοσκούσαν αμέριμνα δίπλα του, ενώ μια αλεπουδίτσα τον πλησίασε τόσο που σκέφτηκε να την κάνει κατοικίδιό του! Η νύχτα που ακολούθησε, αποτέλεσε ακόμη μια πρωτόγνωρη εμπειρία γι’ αυτόν. Λίγο μετά τη λίμνη Honda, αποφάσισε να κατασκηνώσει. Το καταφύγιο που βρίσκεται εκεί κοντά είναι κάπως ακριβό, αλλά νομίζω πως ο λόγος που έμεινε στη σκηνή εκείνο το βράδυ ήταν τελείως διαφορετικός. Η εμπειρία του να βρίσκεσαι μόνος σ’ ένα τέτοιο περιβάλλον δε συγκρίνεται με κανένα καταφύγιο…Ο αέρας ήταν δυνατός και καταπαγωμένος και χρειάστηκε να μαζέψει αρκετές πέτρες και να τις τοποθετήσει πάνω από κάθε πασσαλάκι της σκηνής. Όταν συναντηθήκαμε στο Ουγιούνι και μου έδειξε τα χέρια του που είχαν καταματώσει απ’ το κρύο, κατάλαβα πως τα πράγματα εκεί πάνω ήταν κάπως δύσκολα. Άλλωστε, ήταν το μοναδικό βράδυ που ενώ φορούσε όλα τα ρούχα που είχε μαζί του μέσα από τον υπνόσακο, ξύπνησε αρκετές φορές απ’ το κρύο! Την ίδια ώρα, το γκρουπάκι μας βρισκόταν σε πιο ζεστές καταστάσεις. Είχαμε φτάσει στο χωριουδάκι Villa Candelaria και μόλις είχαμε καταλύσει σ’ έναν ξενώνα, που όπως και κάποιοι άλλοι στην περιοχή, ήταν χτισμένος εξ’ ολοκλήρου από αλάτι. Αυτό σήμαινε πως ήμαστε πολύ κοντά στη διάσημη Salar de Uyuni, την τεράστια έρημο από αλάτι την οποία θα επισκεπτόμασταν την επόμενη μέρα. Ο αλμυρός ξενώνας μας, ήταν παράξενος κι ενδιαφέρων! Ακόμη και τα κρεβάτια μας ήταν φτιαγμένα από αλάτι. Κι ενώ κανείς θα φανταζόταν πως θα τουρτουρίζαμε γι’ ακόμη μια φορά απ’ το κρύο, η σόμπα που η ιδιοκτήτρια άναψε, καθώς και η ζεστή σούπα που μας σέρβιρε, μας ζέσταναν αμέσως. Δείπνο, λίγο κρασί και γρήγορα για ύπνο γιατί την επόμενη μέρα θα ξυπνούσαμε πάλι πριν βγει ο ήλιος, ώστε να θαυμάσουμε την ανατολή από τη Salar! Η κωμόπολη του Ουγιούνι δεν ήταν μια τυπικά όμορφη κωμόπολη. Ή μάλλον, δεν ήταν καθόλου όμορφη, απλώς με τον καιρό τη συνηθίσαμε και νιώθοντας οικεία σ’ ένα μέρος, συχνά έχεις και την ψευδαίσθηση πως ομορφαίνει. Επίσης, όντας το πρώτο κατοικημένο μέρος της Βολιβίας που βλέπαμε, μας έκαναν εντύπωση τα πάντα! Η σκεπαστή αγορά με τις γυναίκες που πουλούσαν από κρέας και λαχανικά, έως έτοιμο φαγητό και συσκευασμένα προϊόντα, ή ακόμη κι ανθοδέσμες περίτεχνα στολισμένες, ήταν από τα μέρη που σαφώς και τράβηξαν την προσοχή μας. Το διάστημα που βρισκόμασταν εκεί, ήταν ο μήνας εορτασμών για την επέτειο της ίδρυσης της πόλης, οι οποίοι κορυφώθηκαν την 11/7 με μια παρέλαση όλων των σχολείων – κολεγίων – ομάδων – σωματείων – γειτονικών οικισμών κτλ κτλ…Αυτό εξηγούσε και γιατί κάθε μέρα από το πρωί ακουγόταν η μπάντα του στρατού να προβάρει εμβατήρια. Πολλά ακόμη ήταν αυτά που μας έκαναν εντύπωση: η ανοιχτή αγορά που οργανωνόταν κάθε Πέμπτη έξω απ’ την κλειστή αγορά, το Κυριακάτικο απογευματινό πανηγύρι με παιχνίδια, ξύλινα ποδοσφαιράκια, φλιπεράκια, λαχειοφόρους αγορές, μουσική και φαγητό, οι ψησταριές με παϊδάκια από λάμα και βέβαια, η ευγένεια της συντριπτικής πλειοψηφίας των ανθρώπων. Έχοντας καταφθάσει στη Βολιβία από μια χώρα ακριβή, όπως μας φάνηκε η Χιλή, νιώσαμε σα να βρεθήκαμε σ’ έναν παράδεισο από προσιτές τιμές. Τί να πρωτοδούμε και να πρωτοδοκιμάσουμε! Λόγω αυτού του διλήμματος, καταλήξαμε στο να μη μπορούμε να φύγουμε απ’ το Ουγιούνι. Και δεν εννοώ επειδή θέλαμε να δοκιμάσουμε όλες τις βολιβιάνικες συνταγές, αλλά λόγω μερικών από τ’ αποτελέσματα αυτών των δοκιμών…Επιπρόσθετα, ο παγωμένος αέρας (η θερμοκρασία το βράδυ έπεφτε κάτω απ’ το 0 και στον ξενώνα ούτε λόγος για θέρμανση – πουθενά άλλωστε δε βρήκαμε θέρμανση) προκάλεσε ένα γερό κρυολόγημα σ’ εμένα κι ένα άσχημο “πιάσιμο” στην πλάτη του Στέργιου…τί άλλο…α, και μια λοίμωξη που επίσης με ταλαιπώρησε, ήρθε να προστεθεί στους λόγους που πρέπει να ήμαστε οι μοναδικοί ξένοι που έμειναν τόσο καιρό εκεί. Οι μικρές αυτές ατυχίες όμως, δε στάθηκαν ικανές να μετριάσουν την καλή εντύπωση που ήδη μας είχε κάνει η είσοδός μας στη Βολιβία. Ούτε καν ο υπάλληλος στο γραφείο μετανάστευσης που πήγαμε για να επεκτείνουμε τη βίζα μας και μας είπε πως πρέπει να πληρώσουμε 20BOB – ενώ γνωρίζαμε πως είναι δωρεάν – δεν κατάφερε να μας εκνευρίσει αρκετά! Στο Ουγιούνι συνέβη ακόμη και μια απ’ τις πιο ευχάριστες συμπτώσεις: Κάποια μέρα που εγώ ήμουν στο κρεβάτι του πόνου, ο Στέργιος είχε βγει στην αγορά και γύρισε όχι μόνο με τα σαλατικά της μέρας, αλλά και μ’ έναν ακόμη ταξιδιώτη. Ήταν ο Λούκα, ο Ιταλός που ταξίδευε ανά τον κόσμο όπως κι εμείς, με μια Vespa TS 125 (ilgirodelmondoa80allora.com)! Δυο βέσπες που γυρνούν τον κόσμο, παρκαρισμένες σ’ ένα χόστελ κάπου στη Βολιβία…Φυσικά και ξέχασα τον πόνο μου, σηκώθηκα απ’ το κρεβάτι και το επόμενο 2ήμερο κύλησε με βεσποβόλτες, παϊδάκια από λάμα και μπόλικη μπύρα! Είναι ωραίο να γνωρίζεις ανθρώπους με τους οποίους να ‘χεις τόσα να πεις! Και δε μιλάω μόνο για τη βεσποκουβέντα, αλλά για τον τρόπο που ταξιδεύουμε, τους λόγους που ταξιδεύουμε, γι’ αυτά που μας κάνουν εντύπωση και γι’ αυτά που μας θυμώνουν…Δυστυχώς όμως, Ο Λούκα έπρεπε να συνεχίσει το ταξίδι του γιατί είχε χρονική προθεσμία που έπρεπε να επιστρέψει στην Ιταλία. Έτσι, η γνωριμία μας έκλεισε με μια βόλτα στο νεκροταφείο τραίνων λίγο έξω απ’ το Ουγιούνι, όπου βγάλαμε κάμποσες φωτογραφίες και δόθηκε η ευκαιρία στους δυο βεσποταξιδιώτες ν’ ανταλλάξουν για λίγο βέσπες. Κάπου θα τον ξαναπετύχουμε τον Λούκα, σίγουρα! Μετά από 3 βδομάδες, 2-3 τροφικές δηλητηριάσεις, ένα “νευροκαβαλίκεμα” – για να χρησιμοποιήσω και τον δόκιμο όρο – μια λοίμωξη, ένα κρυολόγημα, πολλά παϊδάκια από λάμα, λίγη μπυρίτσα, μια συλλογή από φωτογραφικά πορτραίτα Βολιβιανών…αναχωρήσαμε επιτέλους για τη Salar de Uyuni! Βέβαια, εγώ μια ιδέα από τη Salar την είχα πάρει μέσα από τα τζάμια του 4×4 που μ’ έφερε στο Ουγιούνι, αλλά δε θα δοκιμάσω καν να συγκρίνω την εμπειρία του να ταξιδεύεις πάνω σ’ αυτή την ολόλευκη μαγική επιφάνεια με μια βέσπα και του να βρίσκεσαι σ’ ένα ολόκλειστο όχημα μαζί με 6 αγνώστους. Ξεκινήσαμε λοιπόν με την πρόθεση να κατασκηνώσουμε εκεί το βράδυ και μ’ ένα μικρό άγχος για το αν θα φτάσουν τα ρούχα που είχαμε για να μας ζεστάνουν. Όσο πιο πολύ απομακρυνόμασταν από τα σημεία της Salar όπου πάνε οι περισσότεροι τουρίστες και βρισκόμασταν μόνοι απέναντι στο μοναδικό θέαμα, τόσο περισσότερο χαιρόμασταν που θα μέναμε εκεί τη νύχτα. Περάσαμε απ’ το νησί Incahuasi (Isla Incahuasi) και φτάσαμε στο νησί Pescado (Isla del Pescado), που ενώ απέχει λίγα χιλιόμετρα, συνήθως δεν έχει καθόλου κόσμο. Στήσαμε τη σκηνή μας δίπλα στο νησί και καθίσαμε ν’ απολαύσουμε το τοπίο. 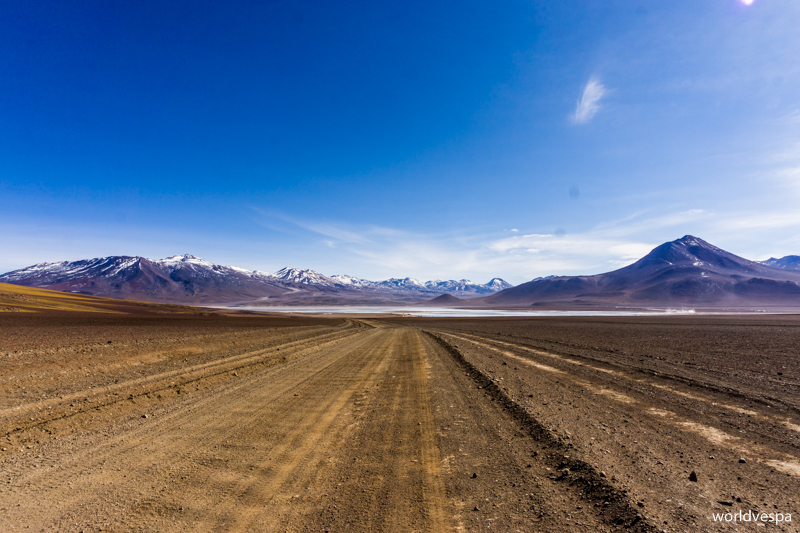 Η μέρα (και η νύχτα) που περάσαμε στη Salar, αποδείχτηκε μια από τις πραγματικά αξέχαστες του ταξιδιού! Οι συνθήκες δε μπορούσαν να είναι καλύτερες: ο αέρας μας έκανε τη χάρη να κοπάσει, το κρύο μας έκανε τη χάρη να γλυκάνει, το φεγγάρι μας έκανε τη χάρη να μη βγει και να δώσει τη θέση του στ’ αμέτρητα αστέρια και οι τελευταίοι επισκέπτες του μέρους, πριν φύγουν, μας έκαναν τη χάρη να ‘χουν μαζέψει ένα σωρό ξυλάκια και πέτρες και να ‘χουν έτοιμα όσα χρειαζόμασταν για ν’ ανάψουμε μια φωτιά! Τί άλλο να ζητήσουμε! Οι φωτογραφίες που βγάλαμε εκείνη τη νύχτα, όσο εντυπωσιακές κι αν είναι, μόνο σε μικρό ποσοστό μπορούν ν’ απεικονίσουν την ομορφιά του τοπίου…Το επόμενο πρωί, δεν αντισταθήκαμε στον πειρασμό: πήγαμε στη μέση της Salar κι αρχίσαμε τα φωτογραφικά παιχνίδια προοπτικής μ’ εμάς και τη βέσπα, που όσο τετριμμένα και να είναι, το αποτέλεσμα παραμένει διασκεδαστικό! Αφού σκεφτήκαμε σοβαρά το ενδεχόμενο να περάσουμε άλλη μια μέρα στη Salar, τελικά αποφασίσαμε ν’ αναχωρήσουμε με κατεύθυνση το Ποτοσί. Στις ειδήσεις του τελευταίου μήνα μιλούσαν για μαζικές απεργίες στην περιοχή του Ποτοσί. διαδηλώσεις διαμαρτυρίας, μπλόκα στους δρόμους και βία…Ήμαστε σίγουροι πως θα καταφέρουμε να περάσουμε. Ποιος θα έλεγε όχι σε δυο σκονισμένους ταξιδιώτες πάνω σ’ ένα ταλαιπωρημένο μηχανάκι;! * Οι περισσότερες τρομακτικές ιστορίες που είχαμε ακούσει γι’ αυτήν τη διαδρομή, αποδείχτηκαν υπερβολικές, άλλες πάλι πιο κοντά στην πραγματικότητα που εμείς ζήσαμε. Εδώ μπορείτε να διαβάσετε ένα άρθρο που γράψαμε για “τους μύθους και τις πραγματικότητες” της συγκεκριμένης διαδρομής. Τα κορίτσα – κορίτσα(στην ταβέρνα)! Συνεχίστε παιδιά με πάθος και δίψα για εξερεύνηση! Μπράβο σας ρε παιδιά.ταξιδεύω πάλι, μαζί σας.καλό δρόμο!!!! Να’ σαι καλά! Καλούς δρόμους και σ’ εσένα! Μπραβο ρε παιδιά, εξαιρετική περιγραφή! Πράγματι απίθανα! Καλή συνέχεια και σ’ εσένα Ηλία! Do you enjoy the ride? Traveling the world on a Vespa!